I was thinking some more about the new game “Shadow of Mordor” (read the review by Carolyn Petit here). I can’t really add anything to her review — she makes it sound like the plot of God of War was transplanted into an Assassin’s Creed game set among some of Tolkien’s ideas — not truly in the Tolkien universe. I wanted to criticize Christopher Tolkien and the literary estate for allowing this to happen, but then I read this article about the Tolkien Estate’s battles with Warner over digital content, and I saw that the Estate had accepted a percentage of the net film proceeds — which is incredible to me. Everybody knows that films don’t make money on net, and if you want to get paid you need a piece of the gross. This is not news. So I started thinking about CT’s age; he sounds pretty sharp in the interview, but the guy was born in 1924, and he licensed the films in something like 2004, so he was 80 then and he’s 90 now. So I’m now I’m just feeling down about the whole thing. I bet when CT dies, Warner will execute their option to dig up the remains of JRR Tolkien, hang him, and then burn him, like the royalists did with Oliver Cromwell. In theory, we’re never supposed to reinvent the wheel. In theory, we’re supposed to fix things correctly. Some time ago I got involved in the Test262 project (you should too!) and, one thing leading to another, I signed myself up to make the Chromium project’s test runners work with a new version of Test262’s test cases. The test cases had switched from a custom metadata format to YAML, a well-designed and well-supported format. Well-supported, that is, except in every python installation on each of the thousands of machines that the Chromium project uses to run its distributed testing. Because py-YAML is not distributed with python, it’s not safe to use for the Chromium test runner. Set up a string, and then ensure that my parser (monkeyYaml) returns the same result as the real YAML parser. This way I can ensure that my parser functions as a drop-in replacement. I have an old stable internal server that’s running CentOS 5.10 which I want to use a staging/development server for modern node.js applications. The problem is, current prebuilt versions of node.js can’t be installed on CentOS5, since CentOS5 has GNU libc 2.5 and the prebuilt node.js RPMs are only for Fedora/RedHat/CentOS 6, and are linked against libc 2.7. Node requires Python 2.6 or 2.7 to build; CentOS 5 comes with Python 2.4, and we need to keep that because yum depends on it. I had a few failing tests. The very first test fails, and takes many seconds to timeout. This is test-abort-fatal-error.js, which seems to be testing the system’s ability to apply resource limits via ulimit. Another test that fails, near the end, is tls-test-server-verify. This sounds ominous, but since I am not planning to use this server in production, I decided to continue. Note the explicit setting of the PYTHON environment variable. When installing an npm module that requires compilation (that executes node-gyp), npm will return an error if it runs with the default system python (2.4), since node-gyp requires at least python 2.7. If you install a lot of compiled packages, or it’s painful to remember to set the environment variable PYTHON every time, you can add export PYTHON=python2.7 to your ~/.bash_profile. It doesn’t seem to bother yum. There are several limitations to this approach. The ulimit, tls, and flooding tests failed. I would not use this node on a production server that is exposed to DOS attacks. Just like in the 1990s, in order to get the next stable version of node, you need to pull the sources and rebuild. This is much easier now, and can even be automated, but it’s a substantial effort that only makes sense if you have no better alternative. If I can get the tests to build cleanly, I’d be willing to package this up as an RPM for anyone who’s interested. EDIT: Here’s another approach, written for node 0.8, but will probably work with 0.10. Note that they use EPEL to find and download an RPM for Python 2.6, and a symbolic link from ~/bin/python to /usr/local/bin/python2.6. Give reaction conditions that would produce a specific product. Functionalizing the phenyl ring would be especially good to ask about, since it would reach into resonance stabilization through the alcohol function, possible interference from the cyclopentene double bond. If I was feeling really mean I’d ask for a retrosynthetic analysis… using only terpenes. One problem, though. What is this molecule? It’s easy enough to draw — I just timed myself at 11s. On paper, that is. But naming is a bit annoying, especially since I haven’t really been using the ‘organic nomenclature’ portion of my brain for the last fifteen years. It’s a 1-ol, phenyl, 2-(cyclopent-2-enyl) … propane? Screw this, I’ll look it up in PubChem! Ten minutes of fighting with the pubchem structure drawing engine reveals that the compound was deposited as (S)-[(1R)-1-methylcyclopent-2-en-1-yl]-phenylmethanol … deposited by the good folks at Nature Chemistry, in fact. Ah yes. 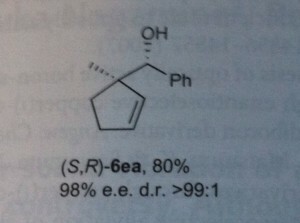 Actually PubChem has a convenient link right to the article, from which I can download the Supplementary information PDF, which contains a slightly different name– ((S)-((R)-1-Methylcyclopent-2-enyl)(phenyl)methanol) and a slightly different diagram (with an explicit Me at the 1-carbon of cyclopentene). And if I drive all the way through the full text of the online article (or Google the InChIKey, GZJFLEKXATUYSK-OLZOCXBDSA-N), I can find that this compound actually has its own home page on Nature Chemistry, with a link to PubChem and downloadable representations of the molecule in ChemDraw and mol formats. I’m not saying this to single out Nature Chemistry, by the way. This is great stuff, and much better than the way it used to be — I am young enough that although I was trained in how to use Chem Abstracts, I was fortunate enough to never need this knowledge. But what if the article had been printed with a tiny QR code in it, like this: This encodes the InChIKey, from which you can easily do a PubChem or Google search. A chemical structure QR code doesn’t just have to be the InChiKey; a journal could include a link back to the figure or compound’s home page. 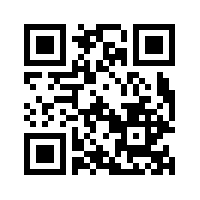 Imagine if you could easily include this QR in every chemical structure drawn in ChemDraw. Imagine if, while going through a stack of reprints or preprints or articles to review, you could easily get to an online structure database and search the literature around a particular compound. I’m starting a week-long work block today — that is, I’m planning to work from 5AM to 5PM straight every day, like a “normal person”. Danielle has graciously consented to spend one week of her vacation doing everything else that needs to get done. Since last week we had a “stay-cation” where we went out to all the Edmonton sights and attractions and ate out at fancy restaurants, I have dubbed this my “work-cation” – which is not pronounced “work cat ion”, for the chemists out there. That would just be anion– err, annoying. 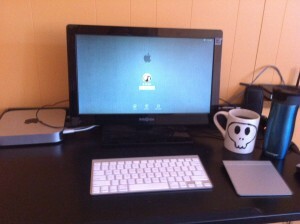 ]1 I moved the mac into the guest room for my workcation. 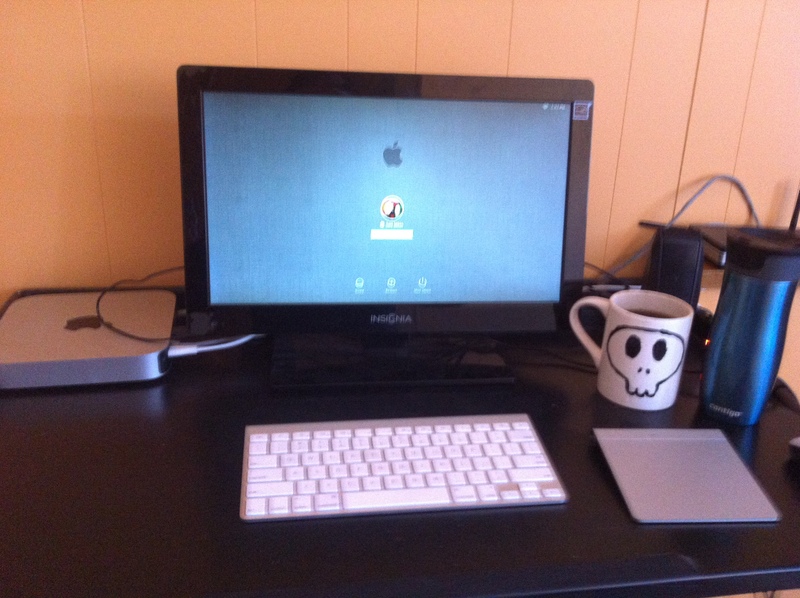 That’s ~1L of coffee on the right there, in my homemade skull mug and Contigo travel mug. 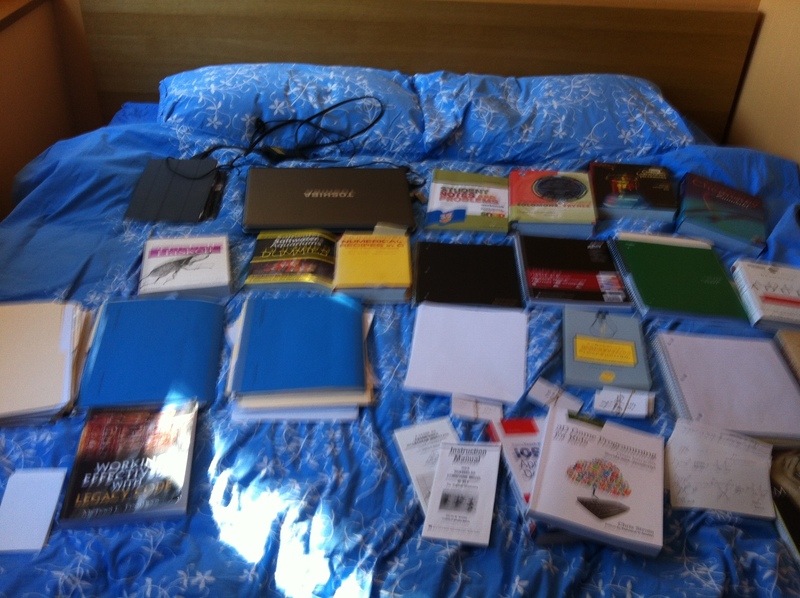 ]2 Notes, books, flashcards, papers for my 2014 March work-cation. My friend Evan asked about design books and I spouted off a few – including The Systems Bible, which I now feel guilty about, because it’s not strictly a design book. I included it because it talks about how system design fails, and it’s humorous and I think teaches some larger truths. It was originally published as “the general theory of systemantics” — a portmanteau of system and semantics — but also a pun, since the first law is that “a system displays antics”. Here are some more book recommendations, broadly disorganized. I was chatting with someone on #node.js who wanted his script to pass a command-line option to node, so that his script was run in a particular node environment. The problem is that under linux you get to pass exactly one argument on the shebang (#!) line. If you use #!/usr/bin/env node, you’ve already used your one argument. When I suggested he use the “-x” hack, we discovered that node didn’t have this hack. So I made a pull request complete with a TL;DR justification for why -x is necessary. ":" //# comment; exec /usr/bin/env node --noharmony "$0" "$@"
The #!/bin/sh causes the script to be identified as a shell script, and passed to /bin/sh for execution. /bin/sh reads and executes scripts one line at a time, and we’re taking advantage of that below. The second line, as interpreted by the shell, consists of two commands. 2a. The first command is ":", which is the quoted version of the rarely-used bash command :, which means “expand arguments and no-op”. The only argument to : is //, which is a valid path. The following # is a bash comment, which is valid until the command separator ;. The exec causes the bash process to be replaced by the node process, so bash does not attempt to process any further lines. The #!/bin/sh line is ignored due to a special one-off in node – when loading a module, the contents of the first line will be ignored from #! up to the first \n. test:2:1: Expected an assignment or function call and instead saw an expression. test:2:4: Expected ';' and instead saw 'console'. test: line 2, col 1, Missing semicolon. But it works right now, as a hack-around for the Linux one-argument shebang problem. ":" //# http://sambal.org/?p=1014 ; exec /usr/bin/env node --noharmony "$0" "$@"
When learning how to do something, it helps to break it down to irreducible subtasks. So following the advice of Susan Wise Bauer, we try to create opportunities for her to practice these subtasks in isolation. William the Silent was born in Germany. He was brought to Spain to learn royal manners. He was born a Protestant, so the king of Spain was worried he would not be loyal. In Spain William learned how to be a Catholic. When William grew up, he was given control of he Netherlands, which still belonged to Spain at that time. Philip, the King of Spain, wanted to destroy Protestantism in the Netherlands. William and the Dutch people waged a war for independence. William became the first king of the Netherlands. A lot of change this year. At the beginning of 2013 I said ‘goodbye’ to a longtime client (15 years). It was time, and past time. From April-May I took about 8 weeks off, drove down to the US with the kids, hung out with a lot of old friends. D was able to get one weekend off (she was working Emerg, so time is a bit more flexible) and so she flew down and we went to her 15-year reunion at Mudd. On the trip I figured out what I want to do for my next project. That’s still dark, though I’ve showed it to a bunch of people. If you want to see it, drop me an email and I can show you the very rough alpha. I’m hoping to do a closed alpha in January and open beta next summer, aiming for a Q3 launch.